I have now completed warmup week two of 20 Second Fitness and I am really feeling good! In the second warmup week you really step it up a notch. The workouts are a bit longer now, about 6 to 8 minutes each day, and way more intense. Most days you will do about 2 minutes of target exercises followed by 4 minutes of what Spencer refers to as "heart pumper" sets. These sets are basically 4 minutes of intense cardio. I was actually really surprised how much more intense week two was than week one. By the end of each workout I was ready to collapse onto the floor. In fact a few days I did. I am starting to develop a little love/hate relationship with 20 Second Fitness host Spencer. I hate him because he makes me do super hard exercises like Star Jumps and Burpees which are practically impossible for me to do. I can only imagine how ridiculous I must look doing these. But I love him because he's motivated me to stick with it these two weeks and it has made me feel good about myself. I will curse him while I'm doing my pathetic version of Burpees but when its done I can stand there and say I didn't give up and I did it! On Wednesday of this past week, after my workout I started to develop shin splints. I have not had those since high school and I forgot how much they hurt. So I reached out to some of the other 20 Second Fitness bloggers on Twitter to see if anyone knew what I could do for them. Lucky me that Spencer saw it and replied with some tips on how help with my shin splints. I thought it was pretty awesome that he took a few minutes to help me out and one day letter I was already feeling better. So with week two completed you may be wondering if I am starting to see any results. As far as measurements and weight goes, I am exactly the same. It has only been two weeks and I am not expecting to see my numbers drop instantly. As I said earlier, I am feeling great about myself and I think that is a huge accomplishment for me. Today I will start week three and to be honest, I am scared. This is not a warmup week, this will be a full intensity workout. Since this past warmup week was rough, I can only imagine what Spencer has in store for me from this point on. Wish me luck and I'll see you back here next Monday! P.S. An important tip from me to you. 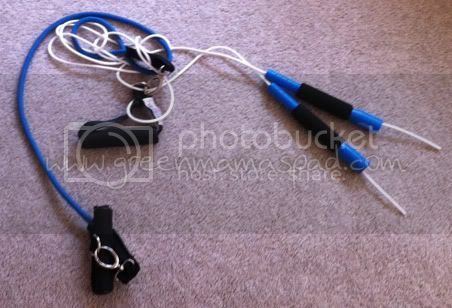 Do NOT let your toddler get a hold of your stretch cord or jump rope. If you do, this is what will happen. Don't say I didn't warn you. I had shin splints so bad when I started working out and running that I quit running forever! I need to get back into it. I had to take the week to get my elbow healed. All better! Can't wait to restart!